It is absolutely fascinating how social media changed our dining habits. Back when phones are bigger than the remote control, we start the meal with a prayer. These days, we start with a flatlay. 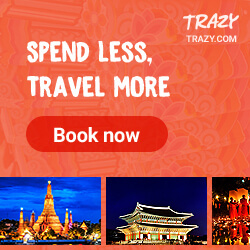 Just 5 years ago, we choose our meals based on taste; now, we choose base on appearance. We have been so concerned with how dishes look and if it'll generate a lot of likes or regrams. We take so many shots that we get used to cold food and lukewarm drinks. And in the age of digitalization, most of us simply have lost the ability to enjoy food the right way. 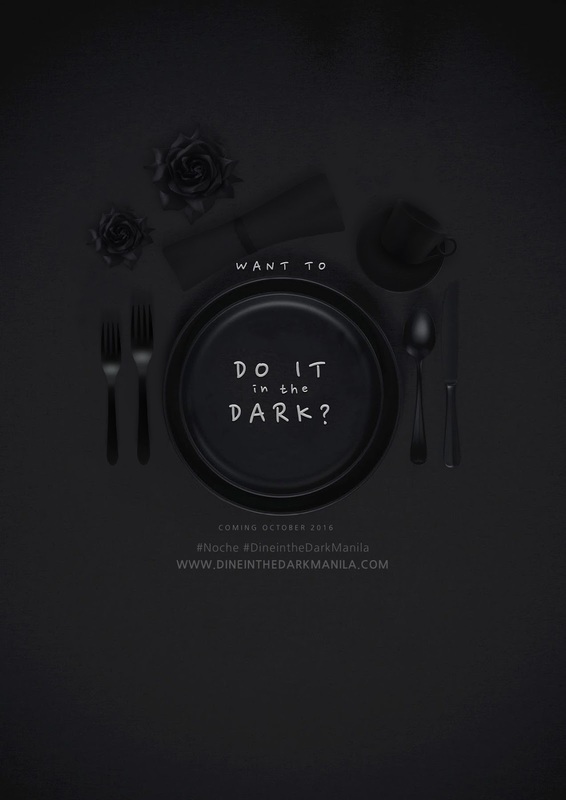 And this is one of the issues Dine in the Dark aims to address. Hello, Dine in the Dark! I was so thrilled when P messaged one weekend informing C and I that we will be the looloo representatives for Noche Dine in the Dark's VIP Preview. I have been eying to try it out with R ever since I saw its teaser. 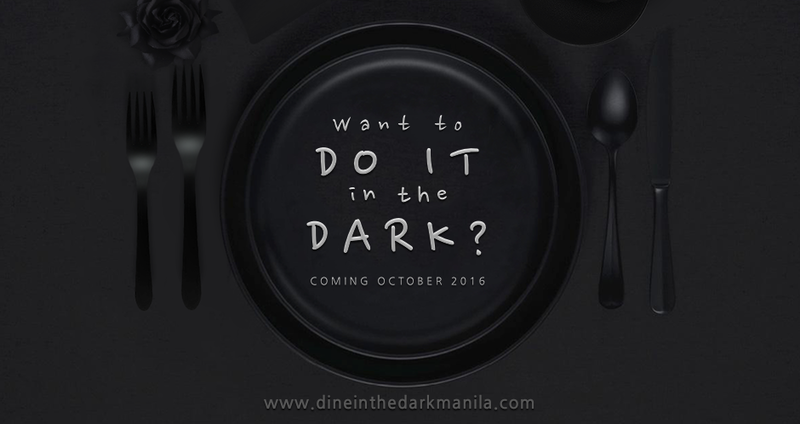 Though I've tried dining in the dark before, I know that it'll be a totally different experience when you're with different company. Days before the preview, C and I had to choose among fish, meat, vegetarian and chef's surprise for our 3-course meal. We both chose chef's surprise because it sounds exciting! And finally, it was 10.05.16! Noche is located at the 4th floor of A.Venue Suites Hotel and before entering the dark realm, one had to proceed to the holding area where diners will be briefed. While waiting for everyone, several braille cards were given and we tried to learn how to read using it. I actually enjoyed memorizing each letter and I plan to master it soon. It was also a very engaging way to introduce us to the world of the visually impaired. We were also given welcome drinks as we sign the registration sheet (to reconfirm your selected menu and to note if one has any allergies) and waiver form. Soon, we were divided into 3 groups and went up a flight, one group at a time. As we reached 4U (upper 4th floor), we were briefed on the table setting and some dos and don'ts by one of the visually impaired staff. 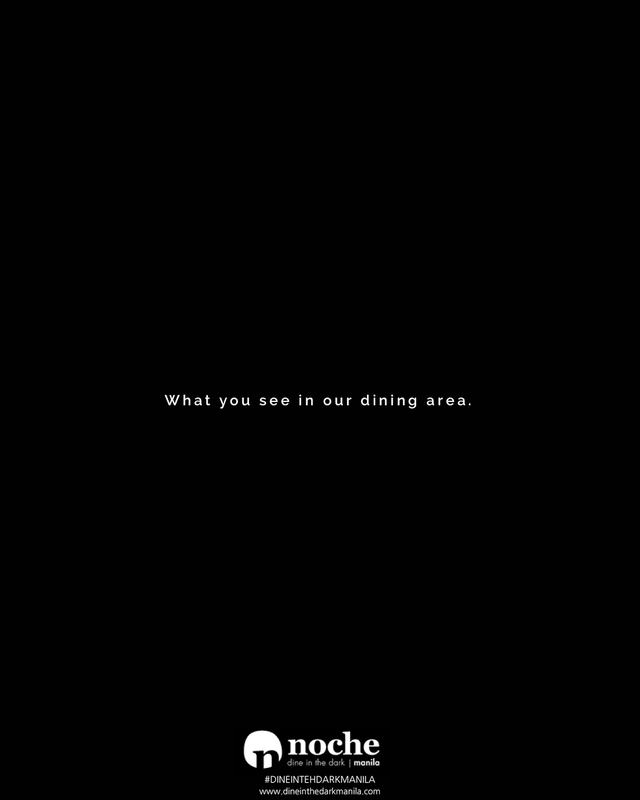 Actually, everyone who will waiting our tables are visually impaired but have background in HRM. Note that electronic devices such as mobile phones, anything that emits light or glows and bags are prohibited inside the dining area. Noche provides a spacious storage area for everyone's belongings. If you are worried that your bag will be mixed up with someone else's, fret not as each bag are properly numbered and you will be given a number card which you need to show afterwards to claim your belongings. After 5 minutes or so, we finally entered the dark room which stripped us of our ability to see. We moved around the dining area inch by inch, worried that we might trip or hit something (or someone). But thanks to our server Carlos, we managed to get to our table without any bump or scratch. It took quite some time before our first dish was served. We really could not tell how long it took as we seemed to have lost the ability to know time as well inside the dark room. We just felt that it was long because we were becoming hangry. Several conversation topics later, our appetizer was finally served. We first used our hands to feel the food. C thought it was a huge sandwich and took a big bite. And it wasn’t a sandwich. I loved it though as it had a lot of interesting textures and flavors. It was also fun guessing what each ingredient was and trying to figure out the best way to eat it. The mains took longer than our appetizer that we started to feel sleepy. But when it was served, we were once again giddy and excited to play the guessing game. Our main dish was a tad salty and forced me to do the thing I dreaded the most… pour water. Let’s just say that I made a splash. After 20 or 30 minutes, desserts were served and I found it… prickly. 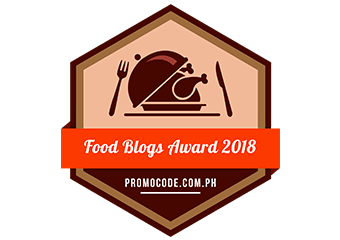 Tasha of Noche mentioned that they really exert effort to add textures to the dishes they serve so make sure that you feel your food first before putting your face close to the plate to avoid having your eyes poked by your meal. Going back to the dessert, it was a lovely harmony of different textures and flavors. All sweet but different in taste. We managed to guess them all right. Well, with all the sweets we eat, we should. We called for Carlos as soon as we were done and he guided us out of the dining area. It took a couple of seconds before our eyes adjusted to light again and the first thing I saw was the long table with all the dishes served. Everyone was busy taking photos of the dishes served but we couldn’t post any as to avoid ruining the experience for the rest who want to try dining in the dark too. They will be changing their menu on a monthly basis though so I guess I could post the food I ate after a month. So for now, I could only post extreme close up photos of the dishes we ate. Overall, food was average and service needs a bit of work but it was a fun experience and I would love to go back for more! Note: For now, Noche Dine in the Dark is open every Friday to Sunday for 6pm and 8pm dinner service. You may choose from two course meal (PHP699), three course meal(PHP999) or five course meal (PHP1,499). These introductory prices are valid until October 31 and will be adjusted to PHP999, PHP1,499 and PHP1,999 respectively starting November. Also, they might just be up for three months so make sure you visit them soon! 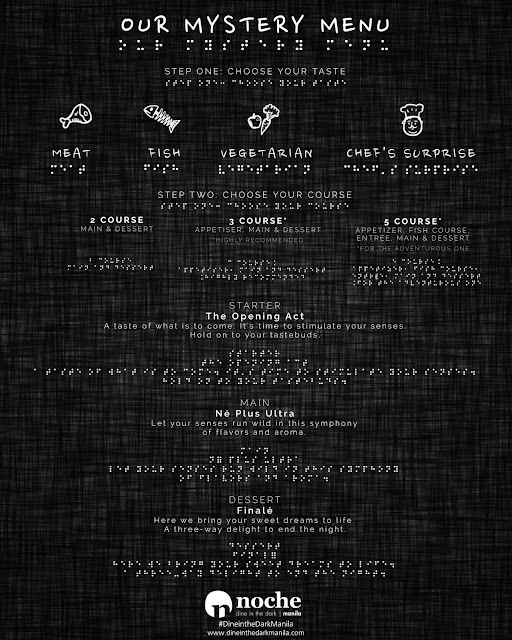 Noche Dine in the Dark is located at A.Venue Suites, 4th Floor, Makati City.